They avoided eye-contact, both of them focused on the flickering flame that struggled for its life on the table between them. 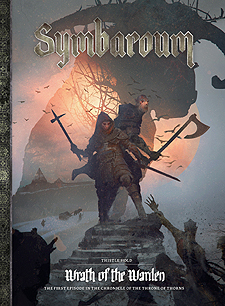 It wouldn't be long before the darkness reigned supreme in their booth at the Salons of Symbaroum. "You feel it too," she whispered to her friend and colleague. "Admit it." "It...It's nothing, only the autumn coming. Damp and windy. Darkness..." "Dampness, wind, darkness, they are all constant," she tried to explain. "Autumn does not come in...swells...". "Maybe you’re falling ill," the friend remarked optimistically. "Maybe you..." The candle went out, as if extinguished by the invisible wave washing over her, a wave that again made her stomach ache and her thoughts darken. She blinked, met her friend's gaze and forced a smile. "You're right, there’s nothing to worry about...just an ordinary autumn morning in Thistle Hold, just a..."
Her words died out, murdered by a clang that hadn't been heard in the town for more than four years – the clang of the alarm bell at the palisade's Northern Gate. Thistle Hold – Wrath of the Warden is the first book in the Chronicle of the Throne of Thorns. It begins with a section that expands on the Core Rulebook's description of Thistle Hold, written for both players and Game Masters. After that comes a section exclusively meant for the Game Master, chiefly containing secrets and information which may be used to create adventures set in the town at the border of Davokar. The final section of this book consists of the adventure Wrath of the Warden – an adventure that undoubtedly will provide you and your friends many entertaining and enagaging gaming hours around the table. A comprehensive introduction to Thistle Hold's history, establishments, factions, and conflicts meant to be read by both players and GMs. Two evocative ruins to explore and guidelines for how to set up for Goal Oriented Roleplaying.